Lots of polls today, as promised yesterday. Seventeen in all. Zogby has released polls in 16 battleground states and Survey USA has a very surprising one in Maryland, showing Bush and Kerry tied at 48% each. Up until now Maryland has been strongly Democratic. It remains to be seen if this result is confirmed by other pollsters. Of the 16 battleground states, Zogby has Kerry ahead in 11 and Bush ahead in 5. Since I round the numbers to integers, my result is 9 states for Kerry, 5 states for Bush, with Florida, and Arkansas tied, even though Kerry is fractionally ahead in both. The net effect is that Kerry has closed the gap in the electoral college from a Bush lead of 116 yesterday to only 17 today, a net gain of 99 votes in the electoral college. How did this happen? 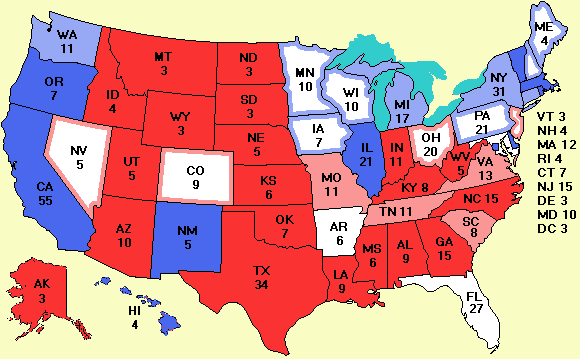 Kerry picked up Iowa, Pennsylvania, and Wisconsin for a net gain of 76 electoral votes, Bush lost 33 in Arkansas and Florida, and Kerry lost 10 in Maryland. The other states polled didn't switch candidates. But as usual, note that states with a white core on the map are essentially tossups, no matter what color the border is. After preparing today's update, I saw a bunch of new polls from Mason-Dixon and Gallup. I just don't have the time to do that today. I'm already spending many, many hours a day working on the site and answering e-mails. I will include these polls tomorrow. I have tried hard to answer all the serious e-mails, but they are now numbering in the hundreds per day, so I simply can't manage them. I will still try to read them all, but if I don't answer your e-mail it is not because I thought it unimportant. There are only so many hours in a day. My apologies. A reader suggested this nice guide for students explaining the ins and outs of where to register. Someone else suggested that when registering voters, bring along a color printout of the map to show potential voters. While on the subject of printouts, if someone could design a nice 8.5" x 11" poster for the site that could be hung up at schools and offices, that would be appreciated. It should include the URL and map, of course, and other information and graphics. PDF or Postscript would be best, although I can convert Word to PDF if need be. Thanks.